유체이탈의 분리 단계를 묘사한 예술가의 그림. 유체이탈(幽體離脫, out-of-body experience, OBE, OOBE)은 사람이 육체 밖의 세상을 인지하는 경험이다. OBE는 문자 그대로 "스스로를 본다"는 오토스코피(autoscopy)의 일종이지만 오토스코피는 두 번째 자신 도펠겡어를 보는 병리 조건을 가리키는 것이 더 일반적이다. 유체이탈이라는 용어는 1943년 G. N. M. 티렐이 저서 Apparitions에 도입한 것으로, 실리아 그린, 로버트 몬로 등의 연구가들에 의해 아스트랄 투사, 영혼 여행, 걷는 영혼(spirit walking) 등의 신앙중심적 용어의 대안으로 채택되었다. OBE는 인간의 정신적 외상, 지각 상실, 임사 체험, 분열성 환각성 약물, 탈수, 수면, 뇌의 전기적 자극 등에 의해 유도될 수 있다. 의도적으로 유도하는 것도 가능하다. 10명 중 1명이 자신의 생애에서 유체이탈을 한 차례, 더 일반적으로는 수 차례 경험한다. 이 부분의 본문은 아스트랄 투사입니다. 아스트랄 투사는 하나 이상의 물리적이지 않은 비육체적인 차원과 이와 연관된 신체가 육체적인 것을 넘어서는 것으로 추정되는 유체이탈 경험의 초상현상적 해석이다. 일반적으로 이러한 차운을 아스트랄(astral), 에테르적(etheric), 영적(spiritual)이라고 부른다. 아스트랄 투사는 영혼이나 영체가 육체를 떠나 영의 세계나 아스트랄계(astral plane)로 여행을 떠나는 것 경험으로 이야기되기도 한다. ↑ Blackmore, Susan (1984). "A Postal Survey of OBEs and Other Experiences". ↑ “(Aug. 24, 2007) First Out-of-body Experience Induced In Laboratory Setting”. ScienceDaily. 2007년 8월 24일. 2011년 10월 6일에 확인함. 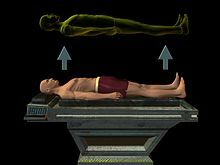 ↑ “Astral body in the Historical Terms Glossary from the website of the Parapsychological Association, retrieved August 26, 2007”. Parapsych.org. 2003년 2월 19일에 원본 문서에서 보존된 문서. 2011년 10월 6일에 확인함. Blackmore Susan (1984). “A psychological theory of the out-of-body experience” (PDF). 《Journal of Parapsychology》 48: 201–218. Blanke O, Ortigue S, Landis T, Seeck M (2002). “Stimulating illusory own-body perceptions” (PDF). 《Nature》 419 (6904): 269–270. Bibcode:2002Natur.419..269B. PMID 12239558. doi:10.1038/419269a. Blanke O, Landis T, Seeck M (2004). “Out-of-body experience and autoscopy of neurological origin”. 《Brain》 127 (2): 243–258. PMID 14662516. doi:10.1093/brain/awh040. Blanke O, Mohr C (2005). “Out-of-body experience, heautoscopy, and autoscopic hallucination of neurological origin. Implications for mechanisms of corporeal awareness and self consciousness” (PDF). 《Brain Research Reviews》 50 (1): 184–199. PMID 16019077. doi:10.1016/j.brainresrev.2005.05.008. 2014년 6월 30일에 원본 문서 (PDF)에서 보존된 문서. 2019년 3월 3일에 확인함. Blanke O, Arzy S (2005). “The out-of-body experience: Disturbed self-processing at the temporal-parietal junction”. 《Neuroscientist》 11 (1): 16–24. PMID 15632275. doi:10.1177/1073858404270885. Brugger P, Regard M, Landis T (1997). “Illusory reduplication of one's own body: phenomenology and classification of autoscopic phenomena”. 《Cognitive Neuropsychiatry》 2 (1): 19–38. PMID 25420137. doi:10.1080/135468097396397. Brugger P (2002). “Reflective mirrors: Perspective-taking in autoscopic phenomena”. 《Cognitive Neuropsychiatry》 7 (3): 179–194. PMID 16571536. doi:10.1080/13546800244000076. Cheyne J. A; Girard T. A. (2009). “The body unbound: vestibular-motor hallucination and out of body experiences”. 《Cortex》 45 (2): 201–215. PMID 18621363. doi:10.1016/j.cortex.2007.05.002. Metzinger, Thomas. (2003). The pre-scientific concept of a 'soul': A neurophenomenological hypothesis about its origin. Schwabe L.; Blanke O. (2008). “The Vestibular Component in Out-Of-Body Experiences: A Computational Approach”. 《Frontiers in Human Neuroscience》 2: 17. PMC 2610253. PMID 19115017. doi:10.3389/neuro.09.017.2008. Terhune D. B. (2009). “The incidence and determinants of visual phenomenology during out-of-body experiences”. 《Cortex》 45 (2): 236–242. PMID 18621365. doi:10.1016/j.cortex.2007.06.007. Visualized Heartbeat Can Trigger 'Out-of-Body Experience'. en:Association for Psychological Science. Out-of-body experience recreated. BBC 뉴스. Out of body experiences and their neural basis. Olaf Blanke. Electrodes trigger out-of-body experience. Nature. Out-of-body experience: Master of illusion. Nature. Out-of-body experiences are 'all in the mind'. en:New Scientist. Out-of-body experience. en:The Skeptic's Dictionary. Out-of-Body Experience? Your Brain Is to Blame. 뉴욕 타임스. 이 문서는 2019년 4월 15일 (월) 13:17에 마지막으로 편집되었습니다.